Yesterday was Eddie's 17th birthday. It marked week 8 of being without a kitchen while the kitchen is under construction. It was also the first night that we went out to dinner as a family during our kitchen-less state. This amazing feat was accomplished because we have a small kitchen in the basement. I am very anxious to be done creating meals in this small kitchen. We don't eat out often, so there was a level of excitement. The night was very typical for us. We chose Chilis because we had a coupon for $5 off. Last week Coach and I ate out. Together. Alone. We hadn't been out alone in awhile. I don't even think we went out for our anniversary because that was the day we loaded everyone into the Great White and drove to Boston. Anyway, it just so happened that a Tuesday worked better than a weekend. We had no soccer, no dancing, and no work. Bingo. We sat down and Coach noticed that the menu stated that kids under 12 eat free on Tuesday nights. The kids were home eating Chicken Cordon Bleu. They love that 'dinner' - I use the term 'dinner' loosely when I refer to the frozen stuff that I shove in the oven before I head for the hills. It was tempting to run home and grab Reg and Curly so they could eat out for free. Instead we said we'd do it again another time. Eddie's birthday landed on a Wednesday. Wednesdays are insanely busy around here with activities, plus Coach works until around 9. We opted to celebrate a night early. We don't usually eat out for birthdays, but we made an exception. We sat down and realized that the kids eating free only worked if the kids ate off a kids' menu. Curly was fine with it. Reggie ordered off the real menu. This gang I'm raising doesn't mess around. They have serious appetites. Coach waited until after our order was placed to share his disgust that Reg didn't order off the free menu. It was like an episode of the body snatchers. Where was he when the ordering topic was discussed a bit earlier? I requested that Reg take one for the team and go track down our waitress and change his order. He wasn't happy about it, but he did it. Before we ordered the Chilis staff sang happy birthday to a kid at another table. Ed glanced at me, and informed me that they better not sing to him. I had no intention. We tend to draw enough attention without a singing fiasco added to the night. We were nearly done with our meal when the waitress asked us if we drone a dodge caravan. Yes. Oh, because someone left a car door open on a red caravan in the parking lot. Cool. We could see our minivan from the window and the sliding door on the far side was indeed open. Sweet. Before we ordered Reg and Curly played with this little black mini computer looking thing that sat on each table. While we were waiting for our bill, Coach grabbed it. 'I wonder if we are supposed to pay for the bill on here. Maybe that's what is taking so long.' Mini had to be at Church for a meeting about Confirmation at 7 pm. Our early dinner was starting to push the envelope. Coach found our bill. He was confused. There was an item called 'molten' that was $7.95. At first he thought that the kids had racked up a charge for playing games on the stupid table computer. Then he started asking if someone ordered something called 'molten.' There were already charges for 7 entrees so it didn't make sense. Just then our waitress appeared. She had apparently heard me tell Eddie to order what he wanted since it was his birthday. She was carrying a plate of cake and ice cream with several forks stuck in it. Fortunately she hadn't alerted the rest of the staff that a singing telegram was necessary, so we were able to walk out of the restaurant without limping out on broken limbs. Coach asked her what the extra charge was for. 'Oh, that's for this birthday cake. Your bill isn't ready yet. I still have to take the cake off the bill. It's complimentary.' Mystery solved. We all exhaled jointly - particularly Reggie and Curly, who feared that they were responsible. Perhaps I should say mystery devoured, because my kids dove into that thing with true Shenanigan style. I'm hoping it's the age, but Eddie tends to dislike most of his siblings except for the two youngest. He also dislikes dessert or anything that isn't ultra healthy. He required one bite of cake before he shared it. When the free-for-all erupted, he was more than a little outraged. 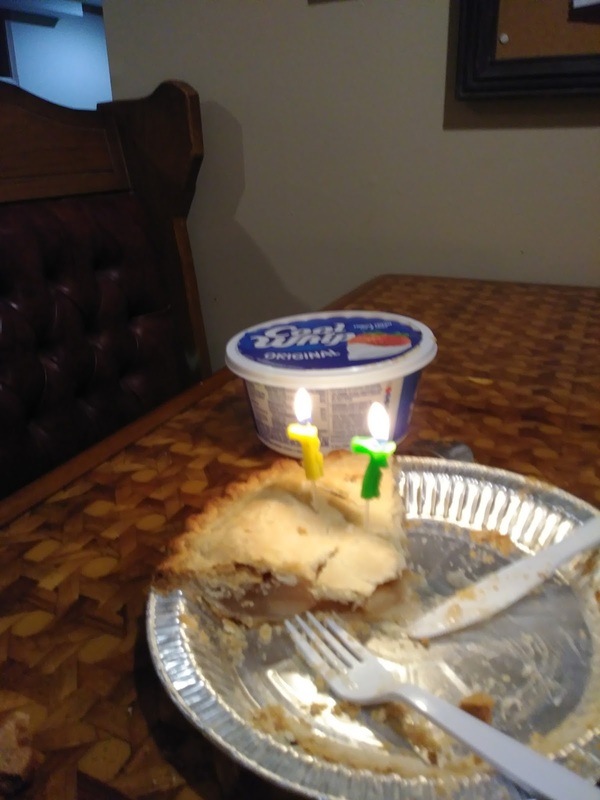 Last night, on Eddie's actual b-day I served a frozen pie in my former Burger King booth in the basement. I'm trying to empty out my fridge, and I had no idea so many frozen pies were just hanging out in there. We ate in shifts, opened gifts long after bedtime, and posed the kids for a photo while holding up a poster of Laddie from his senior year football season (school issues them to varsity athletes - we aren't the life-size-poster ordering type). Kids complained about sitting close to one another for a photo, and I begged Tank and Reg to review what minimal amount they were packing. I am taking the two younger boys to New York today to see Laddie. He has 3 water polo games. It should be an adventure. Mini is his main target for teenage, eye-rolling, we-can't-be-related angst. She asked for his criticism though when she tried to accomplish shoving a four-bite sized forkful in her face . . . and missing. It was her turn to sample the cake, and she apparently feared that was the only opportunity she would have to taste it - or quite possibly to taste cake ever again in her life. Evidence that she is my daughter. She is the one I fear for the most if celiac disease becomes her reality. Coach paid the bill - and gave the two youngest the stink eye because there was a small charge on the bill for their game playing. The car ride home was festive as everyone imitated Daddy, 'What is MOLTEN? Who ordered that? Is this for that game thing?' Just what this family needs another quote.